Philadelphia session guitarist Bobby Eli has spoken of discovering James Bounty (whose real name seems to have been Jame Bunter) singing to an Otis Redding record outside a music store, and listening to this disc you can hear why Bounty might want to do that. 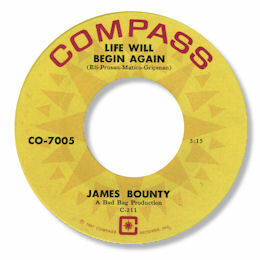 Bounty (whose real name was James Bunting) had three 45s issued but nothing in his recording career can come anywhere near the excellent Life Will Begin Again. This melodic waltz time tune has a truly wonderfully emotive Bounty vocal with the occasional gritty phrases for added emphasis. The pianist does a fine job keeping the rhythm section together and the horns are quite superb. A real 5 star side. All the other sides that James cut are more in the dance vein and don't feature anything like the same emotional oomph.